Christmas Dinner – What's for Dinner Moms? 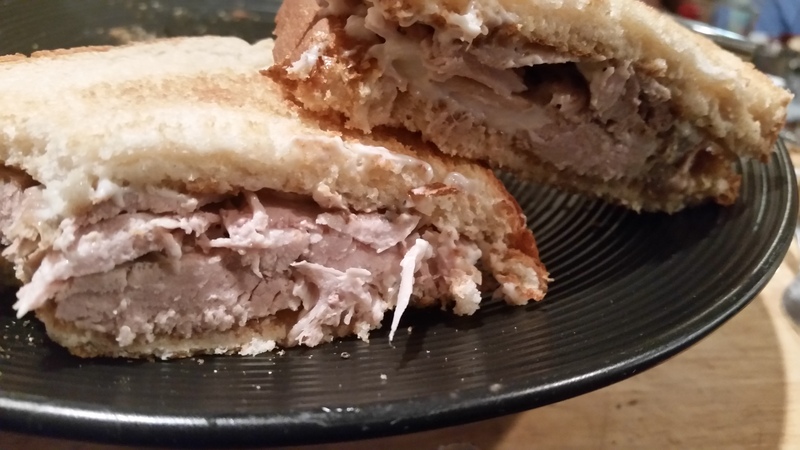 My favorite turkey sandwich on toasted white bread. We actually don’t cook on Christmas Day. Everything is made on Christmas Eve and we snack through both days on all the food. There is a 20 lb. turkey with stuffing, Pigs in the Blanket (our family German version of Cabbage Rolls), Apple Kuchen, Christmas cookies, and lots of candy. Each item is made because is holds some special place in our heart from our pasts. Combining two family traditions means tons of food in our house! What did you have for Christmas dinner this year? Previous Post Don’t Throw Away Those Leftovers! Wow! That sounds amazing! Hope you had a great day! Awe, thank you so very much! That looks delicious. I’m getting tired of little plates of holiday food. We do always go out on Christmas day itself. What a wonderful tradition to go out. I don’t think there are any restaurants open here on Christmas Day. I think even the local Chinese place is closed. Hope you had a great day! We had a gorgeous bone in prime rib roast from Rubinos with mashed potatoes and green beans and lots of cookies. Lol we cooked it on Christmas Eve and then snacked all day yesterday. Last night’s dinner was bacon omlets! Tonight is beef stroganoff in the Crock-Pot! Yummy, Rubino’s ❤ Beef Stroganoff sounds delicious. We are having slow cooker white turkey chili. Slow Cooker seems to be the perfect way to cook today! That’s how we do it on New Year’s day. Lots of leftovers from the day before. I like your Christmas dinner. You wrote Apple Kuchen (not apple cake) and you mentioned the German version Cabbage Rolls. Is there a certain relationship to the German language or a country where people speak German? My great- grandparents, on my father’s side, were from Germany and Hungary. They grew up with lots of German traditions and some we try to hold on to today. That’s cool! I am Austrian – born in Vienna – and therefore close to the Hungarian border. The Austrian kitchen has a lot of dishes from Hungary too, next to their own specialties which are mostly very close to German and Swiss dishes tool. Ooo, thank you! I need to look that up! Oh, yes, please do! The Swiss have a lot of cheese dishes. The Austrians are big in sweets and in all varieties of schnitzel and roasts! BTW My kids thought it was so cool when I told them where you were from! Haha… I bet! You met one of the few living in that tiny country… lol! We have a table set up with sausage, cheese, eggs, potatoes, veggies, pickled herring and snack type foods. We usually have this both days, Christmas breakfast is always pretty big, bigger than Christmas dinner. Then my husband’s family always has homemade tortellini. Your Christmas dinner looks great, my grandma (father’s side) always had what we called Christmas bread, she was full blooded German, we loved that sweet Christmas bread. Sounds delicious! We have made the bread a few times but usually not at Christmas because we have so much other food. It is my Dad’s favorite. Yum! I need to make pirohi and borsht. I have never tried. Sounds delicious. We had Duck and Sausage Gumbo, both days, since it’s better the next day. Ooo, yes! Delicious. Family tradition or just what you chose this year? Thank you. Gulf shrimp on Christmas was quite a treat. My husband makes the best red beans and rice. A little bit of kick. Just enough to sweat. Ha! Merry Christmas! I hope you and yours have a blessed new year! Thank you so very much! Same to you! We kept it simple at mom and dad’s house and just had little frozen items mom picked up! That is perfect! I am planning my New Year’s Eve menu and trying to balance fresh and frozen because I also want to enjoy our evening. It sounds like you had a fabulous Christmas without having to cook! I made a rib roast, scalloped potatoes and salad. I love scalloped potatoes! They are one of those dishes I remember from my childhood. Sounds like a wonderful dinner! I like the idea of not cooking on Christmas.